CAGS (Croydon Area Gay Society) is a society for lesbians and gay men in and around Croydon. We have about 200 members. Our social diary normally contains at least two social events a month, for instance coffee evenings, wine and cheese parties, music evenings, and restaurant visits, and once a year our summer garden party. See our Diary Page for coming events. As well as our social events, we put on events from time to time for a wider audience, for instance stalls at Brighton Pride, London Pride, and the Croydon Summer Festival. For more about these events, see our Past Events page. CAGS is run by a Committee elected annually by the members. See our Constitution for more details. CAGS took part in Croydon PrideFest on 15 July 2017. We carried our banner in the parade and had a presence in the community area in the Queen's Gardens. See www.croydonpride.org.uk. CAGS once again hosted a Garden Party for all local LGBT people, on Sunday, 27 August at 2:30 p.m. Food provided, music by 'Cross the Line'. February every year is LGBT History Month. For several years CAGS has been working with other local LGBT organisations to promote a variety of events throughout the month. For details and photos of LGBT History Month events in 2017 and previous years see www.lgbt-croydon.org.uk/lgbthm. We get coverage from time to time in the local press and the national gay press. Our press page has full details, plus links to the text of our press releases. And we've also got a page of items that have appeared in the news. The Society was founded in 1971, as "London Group Seven" of the Campaign for Homosexual Equality (CHE). It's also covered in Amiable Warriors , Volume One, by Peter Scott-Presland. More about Amiable Warriors ... .
All CAGS members receive a monthly News­letter with the full social diary, plus articles of interest. CAGS is promoting a series of open meetings with interesting and entertain­ing speakers, under the name "The Brief Encoun­ter". The events are free and open to all, and are being held on the first Tuesday of alternate months. 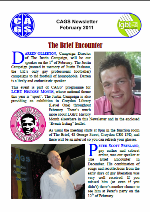 For the full line-up of past and present speakers, see the Brief Encounter page. The Rainbow Reading Group meets on the last Thursday of each month, at 2:30pm at Croydon Central Library. For more information, see the Rainbow Reading Group web page. Silver Rainbow is CAGS' service for older gay people in partnership with Age UK Croydon: we currently have a twice-monthly lunch club for gay and lesbian people over 50, and we're hoping to increase the range of services for older LGBT people in the Borough. For more information, see the Silver Rainbow website. ILGA — the International Lesbian & Gay Association. 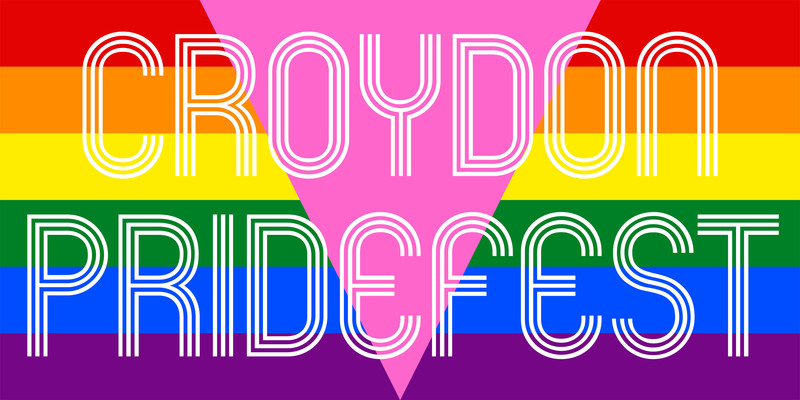 For details of other LGBT Groups in Croydon, see LGBT Croydon. 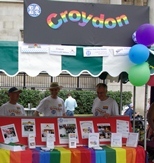 For other LGBT and Croydon links, see our Links page.